Whistle while you work with the latest Intempo portable DAB/FM radio! 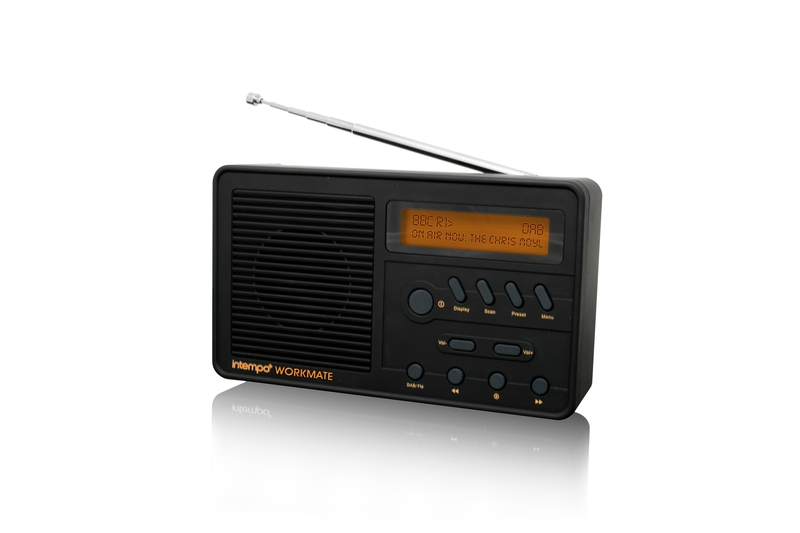 The WorkMate is rugged and reliable with a splash-proof rubberised finish, making it the perfect DIY radio. Available in pure black with zest orange accents, WorkMate will be on sale in October from Amazon retailing at £39.99. WorkMate brings touch and feel back to radio with its tactile but tough rubber casing. Powered by mains or four AA batteries, WorkMate will automatically scan and tune plus there is the option to save up to 20 of your favourite radio stations. “WorkMate will be at home alongside your tool kit for all those DIY jobs or perfect for any outside sport, such as boating or fishing. It’s the perfect gift for dads and granddads so they can tune into talkSPORT while washing the car or gardening,” said Katie Richards, Marketing Manager at Intempo. “WorkMate shouldn’t be confined to the shed though! Intempo has made sure that WorkMate hits the high notes in design, making it ideal for use indoors as a portable DAB,” added Katie. There are now over seven million DAB radios in the UK, with annual sales topping two million. More than a quarter of British homes own a digital radio and currently 90% of the UK population can tune into digital stations which account for almost a fifth of radio listening. Intempo is a unique music technology brand, driving innovation and style in DAB & Internet radio, iPod/MP3 accessories and wireless media. Striking design, a refreshing approach to ease-of-use and a zero tolerance attitude to quality are all Intempo trademarks. Intempo’s product portfolio is borne out of a love of all things music. Constantly innovating, Intempo focuses on converging advanced technology to create products which are designed to let you access your music, your way whether at home, away or on the move. This press release was distributed by ResponseSource Press Release Wire on behalf of Chatterbox PR in the following categories: Men's Interest, Leisure & Hobbies, Consumer Technology, for more information visit https://pressreleasewire.responsesource.com/about.